Took a quick trip to the north state last week. Stopped at my favorite tourist trap to pick up the latest gimcracks, knick knacks, and do-dads. I’m assuming that this specimen is female, but I didn’t look that close. I was there to assess the viability of this statue as a replacement for the proposed but now problematic Arron Sargent sculpture. Since we know little of Ms. Foot’s history, there should be no objection to its placement in our fine town. It would go well with NC’s reputation as a sanctuary for endangered fauna. Hopefully, no one will emerge from the bushes with any flimsy stories about being molested by the beast-woman. Most of the guys I know would gladly copulate with her willingly anyway. Excellent. Please keep us updated on the progress of this project, and let us know if there’s anything we can do to help convince NC to welcome her. 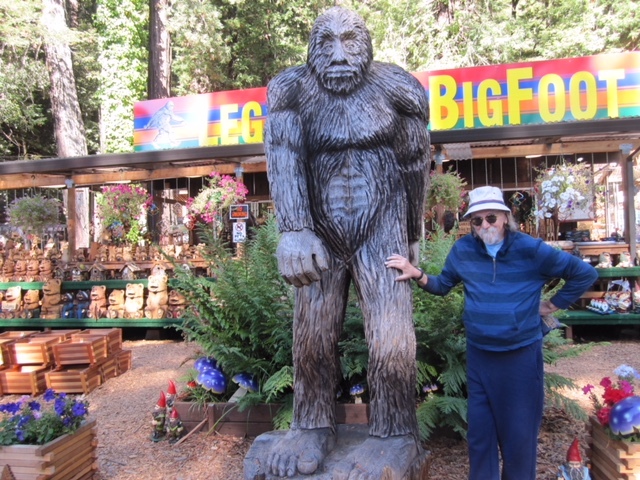 Perhaps the most amazing factoid, in my mind, is that Sasquatch was able to cause you and Rebane to have the first civil conversation that I’ve witnessed on this blog. And if the two of you can agree on something as mystical as Mr. and/or Mrs. Foot, I suggest that President Trump will someday be a fair comparison. Then again, if everyone had the intelligence to see them both for what they truly are, we certainly wouldn’t have had the option to vote for one of them.